Top rudebwoy Disrupt gets busy with fresh dubhead Mahanee and Solo Banton with a remix from MG77's Phokus to ram the dance. 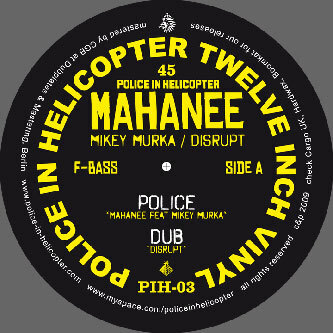 Mahanee's original version features Jahtari and Scotch Bonnet MC Mikey Murka on vocal duties over a heavy modern dancehall production owing some dues to Kromestar styled dubstep. Disrupt's dub version has to be the EP highlight, feeding Mahanee's original through his THC coated filters to ruff up the bass and push out a mad Skwee alike 8-bit dubbers cut. For all the dubstep soundbwoys there's a rude remix from Phokus, building up the rave vibes with climaxing synths and a hard stepping system sounding somewhere between Narrows style dark garage and Rusko style rave cheek. Ace.